This movie-the Roundup Ready Hoedown (and all the others like it)-are disturbing to me. 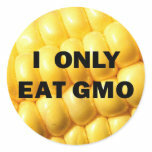 The need for genetically modified organisms (GMOs) is upon us with a population that is growing exponentially. Few have the luxury to choose to eat 100% organically, and I’m sure there are those out there that would venture to say it is impossible. However, I wonder why those waste the money on eating organically, thousands of tests and studies have shown it to be absolutely safe. Spend that money on the poor, the truly hungry. Instead of wasting it on the product of a golden marketing campaign (similar to the brilliant marketing campaign of Angus beef). A.) GMOs are absolutely necessary to feed our nation and the world–which we haven’t even achieved yet, mostly due to the refusal to put GMO’s in most African countries. Finally, Miss Americas’ dreams to “end world hunger” is a reality through genetic engineering! B.) GMOs are vital to improving the food to not only save lives by eliminating starvation, but my solving malnutrition through golden rice and other genetic improvements. C.) GMOs allow us to have the lowest food costs in the world and the safest food supply, for ourselves and the environment. Through GMOs resistance to pests can be put inside the pest-removing the need for pesticides to be applied… allowing farmers to protect the innocent lady bug depicted in the movie through the USE of GMOs similar to Roundup Ready. We all have the same end goal: feed everyone, healthy, nutritious, safe and affordable food. Farmers care. They feed their families the safe, affordable food they grow–because they know it truly is safe and see the value in its genetic traits to make the end goal (of providing for BILLIONS) possible. Make the right choice: support America’s farmers, support our effort to feed the world, and yes-trust the scientific authorities and the organizations deemed to protect our food sources (the USDA, FDA, etc) and EAT GMOs. Claire, I am glad that you agree with my thoughts completely and you are learning so much in the Biotechnology in Agriculture.m Maybe if people started researching and finding out the truth instead of protesting, they could end up feeding the world. If someone wants to choose an organic lifestyle, fine. Organic farmers need a paycheck too! But I wish they wouldn’t sour conventional farming practices for the rest of humanity–especially under false pretenses!! !